The Dow Jones Industrial Average (DJINDICES: ^DJI) has traded at or near record highs throughout the presidency of Donald Trump. That has spurred frequent comments from the White House about the stock market’s approval of the administration. Data source: Economagic.com. Starting date is either Election Day or date taking office if not elected. Change reflects index change in Dow only with no dividends. Going back to 1896, the Dow has risen in the first 15 months after a new president’s election on 15 out of 21 occasions. The gains have ranged from Theodore Roosevelt’s modest 0.1% increase to Franklin D. Roosevelt’s 68% jump. By this measure, President Trump ranks No. 2, with a 37.6% rise that just edges out Calvin Coolidge’s 36.1% gain. 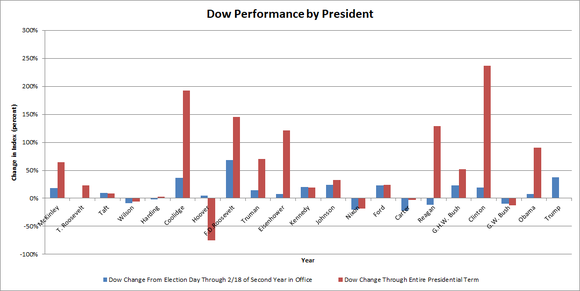 Both Coolidge and FDR rank among the top three presidents in terms of Dow performance, but the biggest gains came during the Clinton administration. After an initial gain of just under 20% in the first 15 months after the election of 1992, the Dow surged, giving Clinton a total eight-year gain of 236.7%. It’s far too early to tell how the Trump administration will fare throughout the extent of his presidency. Historically, though, early success has tended to carry through to the end of a president’s stay in the White House. * Stock Advisor returns as of Feb. 5, 2018.